A grade 2 fire ruined an entire floor of a 21 storey residential building near Mumbai Central railway station behind Maratha Mandir theatre. The building contained railway officers’ quarters, fourteen people were reported to have been injured in the blaze. No casualties were reported. The cause of the fire was a short-circuit on the fourth floor. It was noticed around 11:15 am which eventually spread upwards toward the terrace. An initial observation by the fire brigade officials found the fire to be of grade 1, but it gradually turned out to be a grade 2 fire. Eight water tankers were sent to the spot to douse the flames, which took considerable time to be brought under control. “A lot of smoke was seen coming out from the floor where the fire broke out, which caused panic amongst the residents and made the evacuation process a little difficult,” said a civic body official. Of the 14 injured, seven were taken to BMC-run Nair Hospital while seven were admitted to Jagjivanram Hospital, which is run by the Railways, in Mumbai Central. The patients are between 17 to 85 years of age. A short-circuit caused in internal wiring of a residential complex in Empire Estate in Chinchwad caused a fire which gutted as many as 25 electricity meters installed in the building. Had not proper action taken place by the residents, a major fire could have broken out which might have caused serious damages to its residents and the building. The building located along the Pune-Mumbai highway comprises of 1,600 flats. Vijaya Naidu a resident who lives on the first floor of the twelve storeyed building states that she woke up around 4am to the sound which was similar to that of bursting firecrackers. She saw smoke billowing from the place where electricity meters were placed in the building. 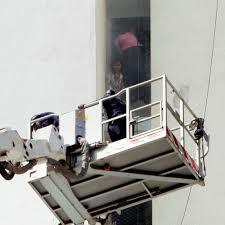 Her family rushed out of the building and alerted others, police, fire brigade and the Maharashtra Natural Gas Limited. The fire brigade and other civic official rushed to the spot which prevented the fire and a major disaster well in time. If the fire was not brought in control, it would have spread to around 200 two wheeler’s and four wheeler’s parked in the premises.